·Facebook tops the list of sites that kids sign up to underage with 52% of 8-16 year olds admitting they had ignored the site’s official age limit - followed by WhatsApp (40%), BBM (24%), SnapChat (11%) and Ask.fm (8%). At aged ten, over half (59%) of children have used a social network. ·children are opening themselves up to potential risks, with 21% posting negative comments starting from the average age of 11 and a quarter (26%) hijacking another’s account and posting without permission. Furthermore, 43% have messaged strangers starting from an average age of 12. ·a child’s social media development begins aged nine and over the next four year period, their internet activity evolves from simply viewing content online to being active on social media. At nine, children first access YouTube and at 10, they start using Internet slang (e.g. “BRB”, “YOLO”) and instant messaging. ·at 11 years, children are likely to first post an image or video of themselves, post a nasty comment online and set up a fake social media profile. At 12, they first try Twitter and Whatsapp and message someone online they haven’t met in real life; and at 13, they first try services like SnapChat and try sexting for the first time. "The internet offers wonderful experiences for growing and inquisitive young minds. Yet, as social media has removed the barriers between a young person's public and private self, children can become vulnerable and compulsive online sharing can lead to danger. As this study shows, children are gaining access to social media sites at a younger age, which could expose them to content, people or situations that are out of their depth and which they're not emotionally prepared for. Parents can no longer protect children by simply trying to limit their online experiences. Instead parents need to maintain an open dialogue and encourage children to share both good and bad online experiences, talk openly and straightforwardly with their children about the risks they may encounter online without scaring them, and make sure they keep up with the latest social media crazes and work with their children rather than trying to control them." There was substantial press coverage (click here to view an example). TV dinners and smartphone suppers begin in toddlerhood for almost two-thirds of the nation’s little ones (62%), While almost half of UK parents (41%) see the everyday meal occasion as an opportunity for family bonding, the GrowingUpMilkinfo.com research reveals a majority of toddlers (69%) are often transfixed by a screen during family mealtimes and would kick up a fuss if the TV or iPad was switched off. More than a third of those toddlers watch TV or a DVD (36%) at the table. Hand-held gadgets are next with iPads (28%) coming second, followed by smartphones (24%) and hand-held games (12%). Tantrums (38%) and boredom (35%) are the main reasons most mums and dads turn to technology during mealtimes, with just one in twenty (5%) prioritising the nutrition of their little one at the table. “The family meal is such a wonderful time for parents and children to share their feelings, thoughts and ideas through face-to-face communication, while also providing good nutrition to support toddler growth and giving parents opportunity to encourage positive eating habits. Richard gave numerous radio and press interviews. He also made a short video about fussy eaters shown below. The McCain 'Food For Thought' Survey. 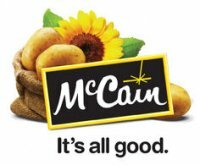 The Potato Story is an unbranded educational initiative developed by McCain Foods (GB). Focusing on food provenance, The Potato Story uses the journey a potato makes from 'field to fork' to teach children in a fun, interactive and engaging way. McCain organised a very successful radio day in which Richard was interviewed by a range of radio stations about the Food For Thought Survey.